Bild tagen och redigerad av Carmen Bernu. Yesterday, The Hobbit director Peter Jackson pulled back the curtain on “I See Fire,”the Ed Sheeran song that will play over the closing credits of The Hobbit: The Desolation of Smaug. As Jackson explained on his Facebook page, the process began when the two had lunch during Sheeran’s tour through New Zealand, and continued after Jackson brought Sheeran in to view the movie and work on the song. Sheeran’s also a longtime devotee of the work of J.R.R. Tolkien—The Hobbit was the first book his dad read to him as a child, and Sheeran’s grandfather owns a first edition of the novel. His work on The Desolation of Smaug had to fit into a tight schedule; Sheeran will wrap his world tour on Thursday night with a third sold-out concert at New York’s Madison Square Garden. Even for a Brit, that’s a big deal: “My dad grew up watching boxing, and he always said that once you played Madison Square Garden, you know you’ve made it,” he says. Sheeran is also nearly finished with his new Rick Rubin-produced album, due next year. When Sir Peter Jackson was searching for the perfect artist to write a song for the second Hobbit film, he took advice from someone very close to home – daughter Katie. The 17-year-old Samuel Marsden Collegiate School pupil urged him to listen to English singer-songwriter Ed Sheeran before he toured New Zealand earlier this year. “She said that I just had to listen to him, and that he could be the perfect fit for the end of the film . . . and she was right,” Jackson told an exclusive fan event at the Embassy Theatre yesterday. Sheeran was given a special viewing of The Desolation of Smaug – which is not due for release until mid-December – and immediately set to work writing a song, which he called I See Fire, in a room at Park Road Post in Miramar. “He wrote and recorded it almost all in the same day, so what you’re seeing is a direct reaction to Ed watching the film,” Jackson told the audience. Sheeran tweeted yesterday to say “big up” to Jackson and his team for the opportunity to record the song. In the clip of Sheeran performing I See Fire, Katie can be spotted filming him with her cellphone while he records the song. She said yesterday that watching Sheeran during the creative process gave her a “whole new appreciation” for what musicians did. She had been a Sheeran fan for years, and felt his style of music was the perfect fit for the closing credits. Låten heter "I See Fire" och finns på Itunes. NEW YORK — Mario and Luigi rip off their mustaches and chug a cup of beer; minions from “Despicable Me” take turns getting drinks from the bar so as not to lose their spot in the crowd; a female Waldo endures a long night of “I found him, guys!” and a gingerbread man steps onstage with a guitar to croon some tunes. If one hadn’t known any better, it would have been easy to confuse the Mercury Lounge on Halloween night with a land of children’s characters past. But upon closer inspection, one would have realized that these zany characters crowding around the small stage were the 200 fans lucky enough to gain entry to debatably the hottest show of the night, and that gingerbread man onstage strumming his guitar and working that loophole like it’s nobody’s business was none other than Ed Sheeran. Returning to the venue that housed his first-ever New York City gig 18 months ago, Ed waddled his best gingerbread man waddle onto the stage, greeted the crowd with a humble hello and went right into one of his earliest songs, “She.” The crowd let out an audible gasp of excitement before singing along to every word; opening with such a throwback meant that this Halloween night would be filled with way more treats than tricks. 31 Oktober spela Ed in ett avsnitt för "Sesame Street" som kommer visas i USA 2014. OBS. Man kan inte delta från Sverige. 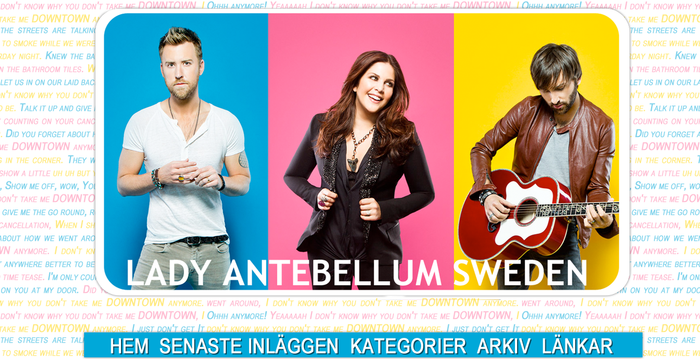 En sida som ni borde kolla in är Lady Antebellum Sweden. Det är en sida som handlar om bandet Lady Antebellum som sjunger country. Bloggen uppdaterar om vaf som händer med bandet och bandmedlemarna. Tryck HÄR eller på bilden för att komma till sidan.